Spam musubi is one of those quintessential Hawaiian foods, like kalua pig and lomi lomi salmon. Nowhere else in the world has something quite like the Spam musubi. Based on the Japanese snack food called onigiri, the Hawaiians melded it with their love of Spam to form this perfect, one-handed meal-to-go. I love Spam musubi. So do a lot of our friends, though they (like most Mainlanders) started out with an aversion to Spam. “SPAM? 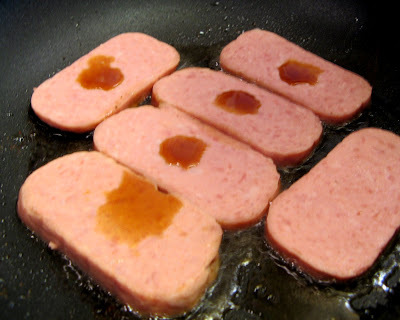 !” they’d exclaim as they crinkled their noses, “why would anyone ever want to eat SPAM? Let me tell you, a spam musubi is the perfect meal. You’ve got meat, vegetable (seaweed), and starch. You’ve got fat, protein, and carbohydrates. You’ve got salty, sweet, slightly bitter (seaweed again) and umami (but no sour – a musubi doesn’t have rice vinegar like sushi). What more could you ask for? 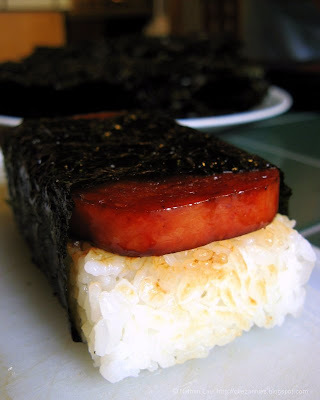 I’m gonna share with you some secrets to making Spam musubi, so that you, too can enjoy this perfect, Hawaiian meal. 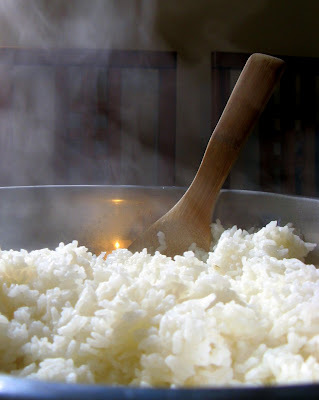 Step 1: get a pot of rice steaming. SECRET #1: For Spam musubi, you want to use short grain rice. It’s stickier and holds together better than medium grain or jasmine rice. Don’t even think about using brown basmati; Spam musubi is NOT health food! Step 2: Open can of Spam, plop the Spam on to the cutting board, and slice it lengthwise into 7 or 8 slices, depending on how much Spam you like on each musubi. SECRET #2: Don’t cut it too thinly, or else the rice-to-Spam ratio will be too much. Balance, young grasshopper. Step 3: Heat a frying pan over medium heat. You don’t need oil – there’s plenty of oil already in the Spam (unless you’ve ignored my first instruction and used low-fat Spam; If you’re using low-fat Spam…might as well forget it, Cuz. Da buggah not goin’ taste good, li’dat!). 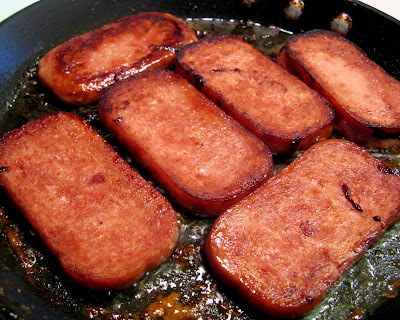 Lay as many slices of Spam as can fit on the bottom of the pan. Lightly drip a couple of drops of shoyu on each slice, then lightly sprinkle a litte sugar on top of each slice. Immediately flip and repeat the shoyu and sugar topping on the other side. Step 4: Fry each side for about two minutes. SECRET #3: You want to fry until you get caramelization of the shoyu and sugar, but not so much that the slice gets crispy and dried out. Remove the caramelized Spam from the pan and set aside. We’re almost ready to wrap. Next, I wanna talk about nori, the stuff you wrap the Spam musubi with. But this post is gettin’ kinda long, so we’ll continue with more secrets to making Spam musubi in Part 2. >I came here via Food Gawker, and I just wanna add that, though regular Spam musubi may not be health food, Honolulu’s Kokua Market on King Street does make a tofu musubi–and yes, they use brown rice! >Huzzah! Thanks for the recipe. I ran across this at a potluck and have been wanting to learn how to make it. >Be sure to come back for part 2, where more secrets will be revealed! >Spam with rice is one of my guilty pleasures. Spam, rice, and nori: that’s one tasty guilty pleasure. I don’t feel guilty one bit about eating Spam! >This is one of our favorite quick and easy meals! >Love your site! I made Spam musubi for my family for the first time 2 months ago. I always see it at the Mom and Pop stores and my Hawaiian friend gave me a mold. We are not regular Spam eaters due to health issues but we love them anyway. My family could not believe how good it was ^_^ Thanks for the tip on using Korean seaweed, I really was not too thrilled about the chewy sushi nori. Yum! >@Sue – thanks for visiting! I hope you find other recipes here that your family will love. >yum! this is my favorite thing to order, i can’t wait to try making my own. then i can decide my own rice/spam ratio. >@mayan – I like a 3-to-1 ratio of rice to Spam. >Muchas Gracias por tu receta,mi hija fue estudiante de intercambio en hawaii, y en dias pasados comentaba que le gustaria comer de nuevo “musubi”, ahora se los podre hacer gracias a tu post. >@NenisQ – You’re welcome! I hope you have fun making these Spam musubi for your daughter! >Nice recipe! It’s interesting that in Hilo where I live, all the Spam musubi’s have Spam in between two layers of rice. They also have a generous sprinkling of furikake which really adds to the flavour. Great site, please keep it going. >I came across your blog in search of the perfect musubi-making method, and I’d say you’ve done it just the way I imagined. But maaan! I sooo need one of those molds. Have any idea where I can get one at a common store in the bay area? I’ll try Ranch 99 down the street. LOVE your blog, and I’ll definitely visit again! You can go old school and save money and just use the cleaned spam can line with cling wrap fill with rice then add the spam then pack down with a flexible silicon spatula then pull out cling wrap and wrap with nori…Pau! >@Tricia – I’m not aware of any stores here in the Bay Area that sell it. If you got friends coming over from Hawaii, you can ask them to get it for you there. Or you can search eBay for “Spam musubi mold”. >Wonderful! Ordered a press off of Amazon – followed your recipe- and now we have a taste of aloha here in Winterport Maine. We have missed our morning musubi at 7-11 so much – now we have a plateful in the frig. Thank you! You have no idea how delighted we are to be able to bring this into our home and kitchen. >@Urey – thanks for letting us know about the Spam musubi molds being sold on Amazon.com. How much was shipping? And thanks again for your recipe and instructions. My wife – who once turned her nose up at the mere mention of Spam – cannot be kept adequately supplied in musubi. I bet we make a "Spam-can full" batch every three days. Between her and my son, I am lucky if I get some scraps of rice out of it. Thanks again – what a wonderful favor you have done. Mahalo! >Wow, that is a lot of Spam! I'm glad you're enjoying the recipe, but I hope you don't get sick of it. I got fed spam ALOT as a kid, I came from a big family and parents used to buy it by the case load. I can not believe that this stuff is thought to be good in ANY form. Tracy – yeah, I can understand how eating too much SPAM when you were younger can lead to this aversion now. If you like, you can try this recipe by substituting teriyaki chicken, ham or hot dogs instead of SPAM. AWESOME recipe, Nate!! I’ve seen that segment on The Food Network Channel a few times and it really got me really keen and curious on Hawaiian food and their spam. So gonna make this now, thanks! SWIFT Theme by Satish Gandham. 54 queries in 0.813 seconds.